Hostas provide a vibrant display of spiked flowers during the early summer months. According to Ohio State University, separating hostas several weeks before the first anticipated frost is the best method for propagation. Hostas have a low germination rate. However, separation takes about 30 minutes and is a simple process to multiply hostas for landscaping or to place in containers for gifts. 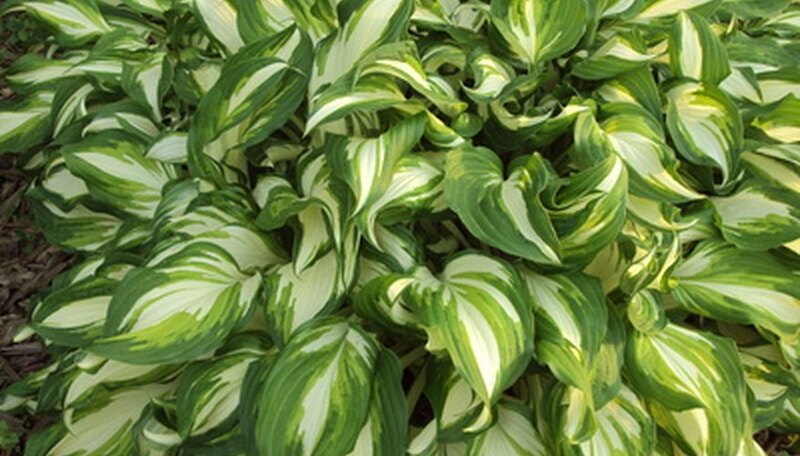 Select the healthiest hostas to separate after they finish blooming and before the first frost. Hold a shovel at a 45-degree angle and dig around the hosta. Begin digging 1 foot out from the center of the hosta plant to minimize root damage. Dig 4 to 6 inches deep. Grasp the hosta plant at the base in the center. Wiggle it back and forth to loosen the plant. Lift the plant out of the ground. Rinse all the dirt and soil from the root ball with water from a garden hose. Set the hosta plant on its side on the ground. Decide on how many separations to make based on the plant size. Larger separations provide a stronger root system and better transplants. For example, a root ball 6 inches in diameter could be separated into two sections. Place a sharp knife at a 45-degree angle at the center point of the first separation. Cut the root ball to separate the hosta into two clumps. Repeat until you separate the hosta into the desired number of clumps. Lay each separated clump on the ground as you work. Dig a hole a minimum of 1 foot deep. Fill 3 to 6 inches with organic compost. Set the separated hosta in the hole. Fill with dirt and lightly tap to secure the hosta in place. Water generously. Repeat with each of the separated hosta clumps. Make certain the knife is sharp to decrease potential root damage to when you separate hostas. Use a 12-inch or larger container to transplant separated hostas. Avoid separating hostas during the growing season in the middle of the spring. Avoid separating hostas into very small clumps. Hostas need the root system to propagate and transplant.